We've been waiting to get our hands on the Eee Keyboard ever since CES, and now we finally did! And guess what? It's pure awesomeness! The LCD on the keyboard is set at 800x480. Contrary to what we expected, this monitor is actually a Sideshow-like stand alone OS running Windows XP. More specifically, this LCDis actually the main monitor of Eee Keyboard, and the external monitor is secondary. If this is true, then theoretically you can control the things on this screen with a mouse. Of course, this is totally unnecessary. 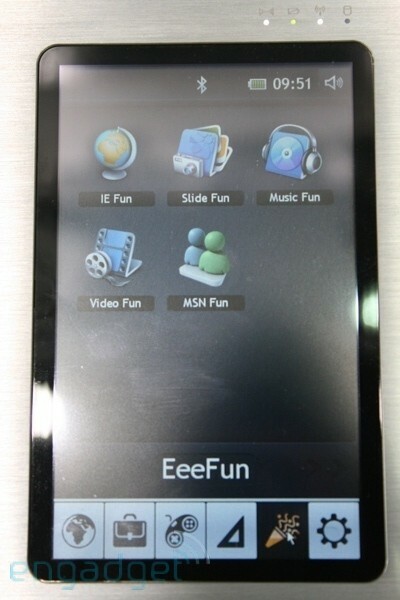 Eee Keyboard has a touch-screen application built right into WinxXP (just like the Eee Top), and it has shortcuts to most of the included softwares. This includes MSN, Skype and Music playback controls. This small app works surprisingly well, and using the the small side screen to control things on the big monitor works smoothly, too. Eee Keyboard will come in two flavors- a wired version, and a wireless variant that uses UWB. The wireless one works through UWB and a small receiver. The keyboard has a built-in battery that lasts for about 2 hours. The temperature of this unit is about the same as Eee PC. We still don't have a word on the price nor the shipping date. Nonetheless, it looks like a really suitable MPC.